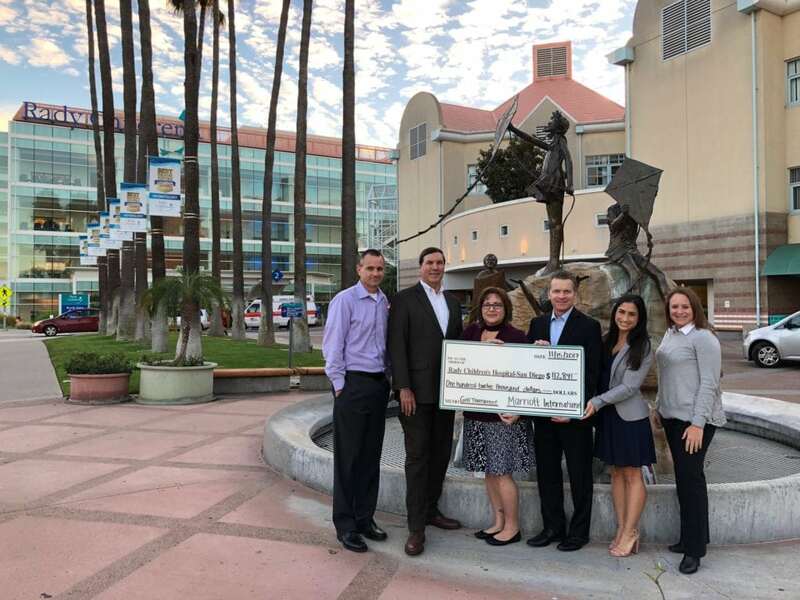 The San Diego Marriott Business Council recently presented a check to Rady Children’s Hospital for $122,841 representing funds raised during their 21st Annual Champions for Rady Children’s Golf Tournament on June 5 at Maderas Golf Club. Each year, the tournament brings together sponsors, donors, golfers and hosts for a day of golf, a dinner program and a silent auction. Among the sponsors of this event were Schindler Elevator Co., Magic Laundry Service, relaxx Dry Cleaning, PSAV, TownePark, Radiant, KONE, GES, and fellow CMNH partner, Panda Express. Golfers at the tournament had the unique opportunity to interact first-hand with the miracles that happen every day at Rady Children’s. Throughout the day, they had a few special VIPs (Very Important Patients) and their families visit the tournament. The strength demonstrated by the patients and their families served as an inspiration to players and volunteers alike, and proved to be the true reward of the day for all involved. The San Diego Marriott Business Council is comprised of hotel leaders from Marriott Managed and Marriott Franchised hotels as well as Marriott Vacations Worldwide. This year, they were joined by leaders from the Starwood community following their merge. Throughout the year, many Marriott locations in San Diego host events at the various hotel properties. The annual golf tournament has consistently been the biggest event of the year, and 2017 proved to be no different. Following the conclusion of the tournament, Marriott surpassed the 2-million-dollar mark for total giving to Rady Children’s Hospital! We are so grateful for Marriott’s continued support of Rady Children’s patients and their families. Save the Date for the 2018 tournament which will take place on Monday, May 7, 2018 at Maderas Golf Club in Poway, California.